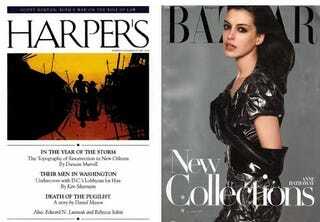 Do people get confused by Harper's Magazine and Harper's Bazaar? We do! After all, the luxury goods industry is not so different from Halliburton — shameless, ubiquitous, and oh so good at charging more for less! So, as usual, we're taking things to their (ill)logical end with a little mash-up of both magazines in the form of Harper's famous "Index" feature, which parses the world of big oil, big money, and Big Pharma and puts it into easily-digested numerical form. After the jump, see how overpriced merchandise, deceased fashion-industry icons and celebrity trainers pair up with prisoner compensation, military casualties and Barry Bonds' shoe size.